Let’s face it; we are living in a replication nation. When original ideas dry out in the entertainment industry all we are left with are remakes of 21 Jump Street, Planet of The Apes and Godzilla. Heck, those shows weren’t even good the first time they came out. Fortunately in the golf world, imitation is the sincerest form of flattery and will get you everywhere if done correctly. One of the finest examples of replication resides at The Castle Course at Northern Bay in Arkdale, WI. Located 27 miles north of Wisconsin Dells in north central Wisconsin, The Castle Course opened to rave reviews in 2006. A year later Golf Digest named the property as one of its Top Ten New Courses. Today, some eight years later, The Castle Course remains the Midwest’s only course with seven replica golf holes within its 18 hole, 7,223 yard layout. The course’s unique ability to transport golfers to seven of the most memorable layouts of all time, while ingeniously surrounding them by 11 original gems cannot be underestimated. According to Mike Williams, Regional Operations Director for KemperSports, this thrilling dichotomy leads to excitement before the round even begins. “We are fortunate that our course has a great reputation. People come from all over the Midwest to experience Northern Bay Resort and the Castle Course. Many people come to experience the replica holes and I think they are excited at the prospect of that. But once they get on the golf course and realize that all 18 holes are truly great, that is what keeps them coming back year after year,” concluded Williams. It doesn’t take long to find inherent value when playing 18 at The Castle Course. A well-stocked pro shop, friendly staff, and immaculate driving range and putting green all greet the golfer before their opening tee shot is even struck. Plus, one of the finest vistas in golf can be found while dining at the aptly named Island View Restaurant, complete with a stunning view of their tribute to the 17th at TPC Sawgrass. “The whole restaurant is built upon the view, and it is a great one,” began Williams. “Whether you are inside looking through the wall of windows, or outside on the deck, the view of No.10 is ideal for a number of reasons. First off, it is great entertainment to watch all the groups come through the hole and reminisce with your own group about the hole. Even non-golfers appreciate the scene because it is so distinctive,” finished Williams. Never wanting to rest on the above laurels of the property, President Darrel Malek forged an important partnership at the beginning of the 2014 golf season. KemperSports, one of the industry’s preeminent golf management companies based out of Chicago, IL, has seamlessly taken over Northern Bay’s management duties. “After assuming ownership in 2010, we have been encouraged by the overall results, however, we felt the need to create a partnership with a firm that specializes in high end golf resort management,” said President Darrel Malek. “After a thorough review, we found that the expertise, capabilities and values of KemperSports were perfectly aligned to partner with us in order to expand on the progress we’ve made. We are also looking forward to seeing all of the new guests that their outstanding marketing network will bring to experience everything that Northern Bay has to offer,” explained Malek. In conclusion, the future has never looked brighter at Northern Bay thanks to the two most important “P’s” in golf – the product and the people that make the Midwest’s only replica course a must-play in 2015! For more information on the entire property, including their stay and play packages, head to www.northernbayresort.com or call (608) 339-8500. A round at The Castle Course might be the best value in golf when you consider how much money and how many favors you’d have to cash in to play all six courses below. With two replica holes from Augusta National and single gems from Oakland Hills, Firestone, TPC Sawgrass, Oakmont, and Bay Hill, the 4 ½ hours you spend at the Castle will make you feel like a King (or Queen). 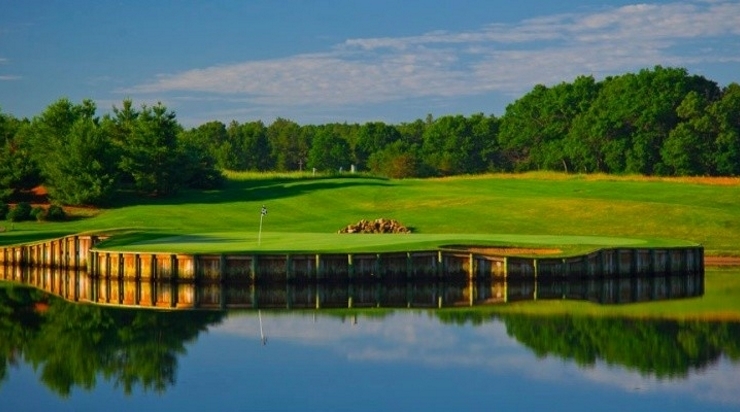 MGM has employed Mike Williams of KemperSports to take you on a tour of Northern Bay’s super seven replica holes including pro tips on how to successfully navigate each one. This mid-length par-3 plays entirely over water from each tee box. The iconic back-left pin position has decided many Masters Tournaments and we like to put it in that location as much as possible. The green has tremendous slope so it’s important to find the right tier and pick the correct club. This iconic hole is a lengthy and tough par-4 and is the No. 1 handicapped hole on Oakland Hills South. The elevated tee shot plays to a fairway guarded by two bunkers on the right. Two bunkers also protect the front of the elevated green. The hole is a tremendous test early in your round. This is a replica of the famous 16th hole at Firestone Country Club – one of the longest and most difficult par-5’s on the PGA Tour. The tree-lined and narrow fairway plays downhill most of the way. Most players will be forced to lay-up in front of the pond that guards the green. Consider it a three-shot approach. One of the most iconic golf shots in the world is the famous island green on the Stadium Course. At its widest point, the green is only 90 feet. Most players will shoot for the middle of the green and walk away with two putts from there. Known simply as the “Azalea” hole, the 13th at Augusta is a short par-5 that doglegs to the left. Longer hitters can cut the corner to the center of the fairway and give themselves a chance to go for the green in two. The green is protected by a creek that runs alongside the left edge of the fairway. The hole is memorable because of the iconic “church pew” bunkers that protect the left side of the fairway. The mid-length par-4 requires a long and straight drive down the middle and a strategic approach shot to a fairly flat green that slopes away. Bay Hill Club and Lodge No. 18 – Known as the home course for Arnold Palmer since the 1960’s, the 18th hole at Bay Hill is a demanding par-4. Favor the left side of the fairway off the tee and take plenty of club on your approach shot that carries over the lake. The entire hole slopes to the right.